YES-DC is an international networking organisation, its members covering a wide spectrum of occupations ranging from engineers, academics to consultants and students. After good growth in the first decade of this millennium, the amount of YES-DC members has been quite stable in the last few years. The more external focus of this year, yielded about 47 new members, and should be continued. 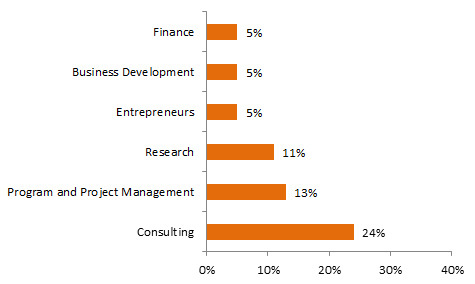 Most of YES-DC’s members are in the consulting sector (24%), shaping together with project managers (13%) and academics (11%) nearly half of our member database. Most of the members are located in the Utrecht area and Amsterdam area, to a lesser extent in the area of Rotterdam, Nijmegen and the Hague. The majority of YES-DC’s members are male (76,5%), but with having 23,5% female members this is considered rather high for an energy related organization. The bulk of the members is born between 1977-1985, meaning that most are in the age group of 25-35 years. Senior members are more present than entry level professional members born later than 1985. Through LinkedIn you can contact fellow YES-DC members directly by becoming a member of the LinkedIn group. Some of our Alumni are also still within this group so there is also a direct connection with middle management and seniors within the field! You, as a member, can join the YES-DC LinkedIn group here. Almost 20% of YES-DC members are employed in a position abroad, and are much valued in that position. YES-DC tries to add value to foreign members through e.g. the newsletter and offering vacancies opportunities beyond the Dutch borders. Although foreign members are seldom present during activities, we keep the connection active through Linked-In and our members’ database connections. If you are living abroad and are interested in taking part in our network, or are in an organization that you think could be interesting to connect with us, please contact as at info@yes-dc.org. YES-DC is increasingly approached by companies to spread information and/or vacancies to our more senior or middle management (experienced) members, hence creating value for members who have crossed the borders of ‘young professional’. We welcome our older members to become part of an alumni group.